Newbuilding ordering activity has started to pick up pace of late, while S&P deals are also on the rise, with more and more owners looking to conclude business deals. 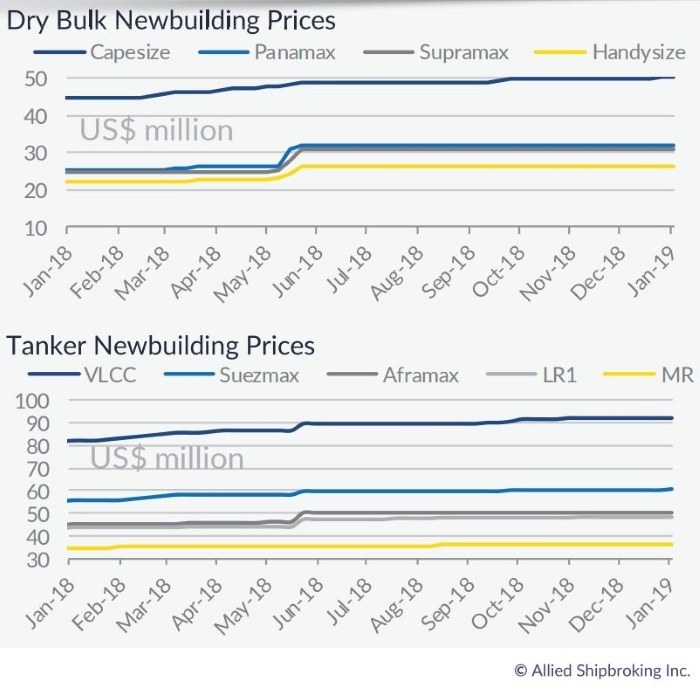 In its latest weekly report, shipbroker Allied Shipbroking said that “despite the persisting pressure that is noted in the dry bulk freight market lately, activity in the newbuilding front remains at moderate levels, with owners foreseeing the stabilization of the rates in the following months. During the past week, 4 new orders were reported across different size segments, with the biggest share of these newbuildings being ordered at Chinese shipyards. Interest for newbuildings is expected to continue firm, but it is unlikely that we will see a significant surge during the following weeks, given the continued uncertainty noted in the market. On the tankers front, improved sentiment and better market outlook in the products segment continue to play a key role, with 3 new orders being added to the product tankers’ orderbook. On the other hand, lack of interest has been witnessed in these first few days of the year in terms of new contracts for crude oil tankers. 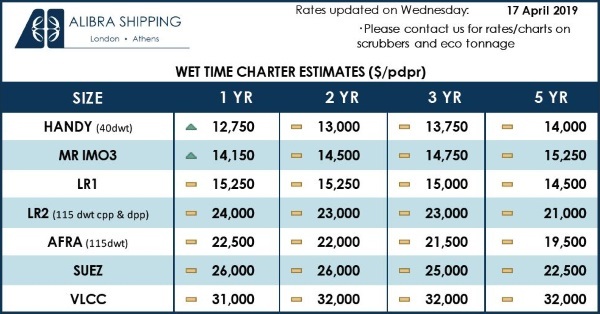 Meanwhile, limited movements have been noted in terms of pricing in both the dry bulk and tanker sectors, but it is unlikely to see some upward movement soon, if activity figures continue at satisfactory levels”, the shipbroker said. In a separate newbuilding report this week, Clarkson Platou Hellas said that “in dry, Shandong Shipping are understood to have ordered two firm plus two option 210,000dwt Newcastlemax at Behai Shipyard for delivery in 2021. There is one order in the specialized tanker market, with Samkang M&T in Korea receiving an order from domestic owner Hyodong Shipping for a single 3,990dwt stainless tanker. Delivery is due in the third quarter of 2020. Whilst the deal was concluded at the end of last year, it has come to light that Dole Fresh Fruit have ordered two firm 915 FEU fully reefer container vessels at Chengxi Shipyard. In the passenger space, Oceania Cruises (Norwegian Cruise Line) contracted two firm 67,000 GT ‘Allura Class’ cruise ships at Fincantieri. The first vessel is due for delivery in 2022 and second in 2025”. 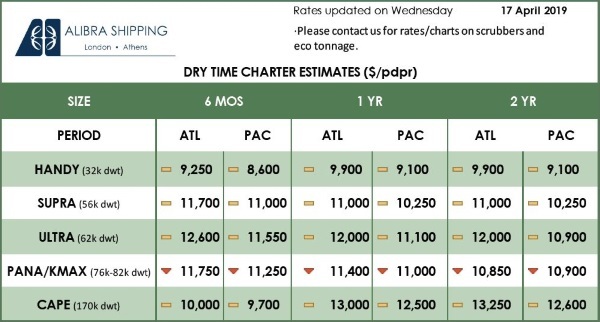 Meanwhile, in the S&P market, shipbroker Banchero Costa said this week that “in the Dry Bulk sector, the “Crystal Star” around 82,000 dwt 2014 built Sonoyas was reported sold at $24 mln to Greek Buyers while two similar size Chinese Jiangsu Newyangzi NB resales with delivery September and October 2019 to Minsheng Leasing were rumoured committed for $27.5 mln. The “Sage Sanaga “ around 63,500 dwt 2013 built Yanghzou Dayang was reported sold at $20.5 mln while the Supramax vessels “Kavala Seas” and “Paros Seas” around 56,000 dwt 2011 Jiangdong China were both understood to be committed to Chinese buyers at $12.5 mln. Similar size but Japanese built “Topaz Halo” around 55,000 dwt 2011 built Mitsui was reported sold to Greek buyers at $15.25 mln. In the Tanker sector, the VLCC “Pacific Glory” around 299,000 dwt 2001 built Imabari was reported sold at $22 mln to Singapore Buyers while the Aframax vessel “Blue River” around 106,000 dwt 2002 built Tsuneishi was rumored committed for $11.2 mln to Greek buyers. The MR vessel “High Glow” around 46,000 dwt 2006 built Naikai was reported sold at $11.5 mln to Far Eastern Buyers while the eight “CPO” MR vessels (“CPO England”, “CPO Finland”, “CPO France”; “CPO Germany”, “CPO Italy”, “CPO Norway”, “CPO Russia” and “CPO Sweden”, all vessels around 37,000 dwt 2009 built Hyundai Mipo, Korea with Ice class 1A) were committed with undisclosed Buyers for $11.5/12 mln each. The chemical tanker vessel “Sichem Defiance” around 17,000 dwt 2001 built Fukuoka Japan was reported done at $7 mln”,Banchero Costa said. 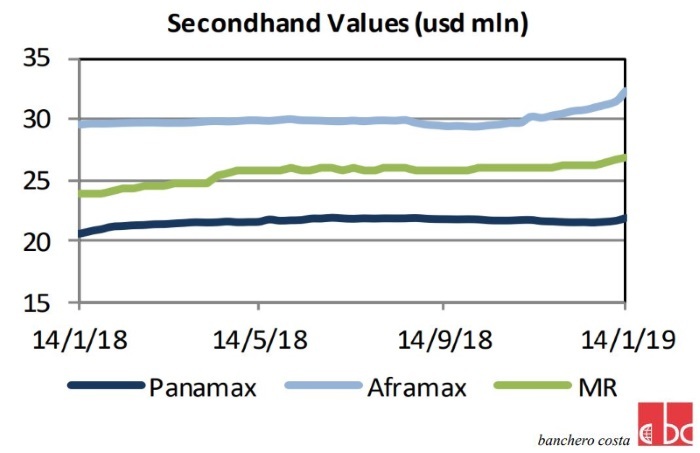 Similarly, Allied Shipbroking added that “on the dry bulk side, activity seems to have gained momentum with several deals being noted last week, with buyers’ focus being shifted towards more modern Kamsarmax and Supramax vessels. Activity is expected to remain at these levels for the time being, as sentiment and appetite seems to be still lurking around, despite what is being witnessed on the freight front. Prices have yet to show any real market direction though there are fears that we may well see some slight signs of softening take place over the coming weeks. On the tanker side, activity was boosted last week. 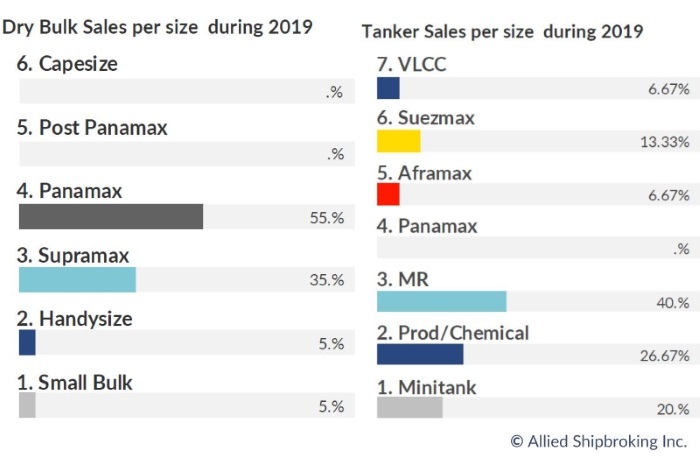 As it was expected, product tankers seem to be attracting the most attention amongst buyers right now, with their market outlook looking to be the most promising at least for the short-run. 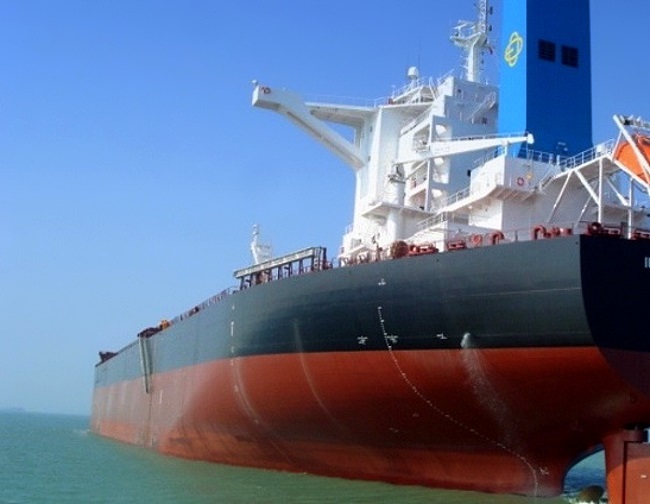 At the same time, few new sales were noted in the crude oil tanker space, despite the trend that was being noted during the final part of 2018”, the shipbroker concluded.